Custom searches are a great way to customise Alfred by adding searches for sites you love to use. Before jumping into Custom Searches, have a look at the dozens of web searches in the preferences. We’ve included a stack of standard searches you’re likely to want to use. Simply type the keyword followed by your search term. There are no doubt websites you want to search that we haven’t included. In that case, it’s time to create your own custom searches! The key to creating a custom web search is to work out the search URL for that site. In this example, we'll create a custom search for the online community Stack Overflow. Fill in these details in Alfred's preferences under Features > Web Search and clicking on "Add Custom Search". By default, the "Encode input as UTF8" checkbox is ticked, which helps ensure your custom searches accept international characters. Some websites encode spaces as %20 or a + symbol between the two words (e.g. magic+tricks). In that case, check the "Encode spaces" and add the + or relevant character in the box as well. You may need to experiment a little, as every website is different, so some may require a slightly different URL format. Use the "Test" button to use the search term alfredapp and search your website until you've got it right. If you can't work out the URL you need to use, pop by the Alfred forum where fellow Alfred users can help you work out your query. Not all apps offer an application URI so it’s worth digging around or contacting the developer of the app. Did you know that your custom “searches” can in fact not be searches at all? Launch any website with a custom keyword by saving it in Alfred’s custom searches. Want to swap custom searches with friends? Use the "Copy URL for sharing" button to copy the custom search and share it with other Alfred users. 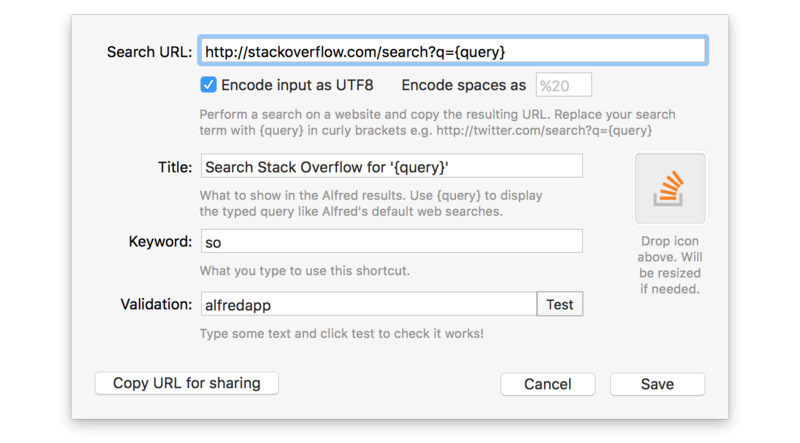 To import a custom search, click on any special URL starting with alfred:// and you'll see a pop-up asking you if you'd like to import the custom search. Websites change and evolve, so searches that worked in the past may stop working. If this happens, take a look at the website you created the custom search for and go through the steps above again. It’s likely that the exact search URL has changed, so you’ll need to update your custom search accordingly.